The Matchmakers at SaB are going to try and bond him with a mate. I have spent quite some time thinking about names. 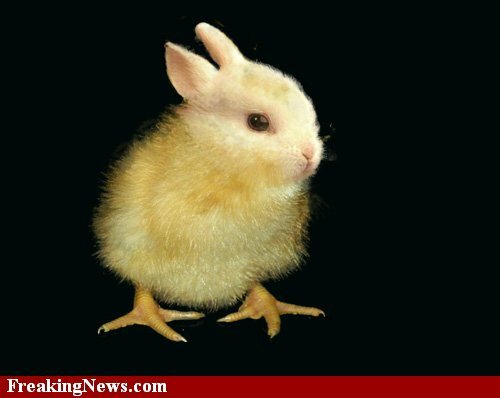 Clearly I can’t decide until I meet the new cheekster, but I do like to speculate … I initially thought the new bunny name should go with Noodles, but Chicken is a bit of a crap name to give to a sweet bunny. If the new bunny is brown, Mango would be good. Mango Noodles. Not sure if that sounds tasty or ghastly. So it’s exciting! In a couple a weeks, I could have another bunny … or I could discover that he isn’t gay or straight, just a hermit. This entry was posted on December 2, 2009 at 3:27 PM	and is filed under Noodles. You can follow any responses to this entry through the RSS 2.0 feed. You can leave a response, or trackback from your own site. Flour, Ramen, Pot, Kaboodles, Maccaroni, Al Dente (if he turns out to be gay), Rice (nah, Condoleezza rules out this one), Spaghetti, … PIIS? Al Dente – I LOVE it!